The Imperial House of Japan (皇室, kōshitsu, "Imperial House"), also referred to as the Imperial Family and the Yamato dynasty, comprises those members of the extended family of the reigning Emperor of Japan who undertake official and public duties. Under the present Constitution of Japan, the Emperor is "the symbol of the State and of the unity of the people". Other members of the imperial family perform ceremonial and social duties, but have no role in the affairs of government. The duties as an Emperor are passed down the line to their children and so on. The Japanese monarchy is the oldest continuous hereditary monarchy in the world. The imperial house recognizes 125 monarchs beginning with the legendary Emperor Jimmu (traditionally dated to February 11, 660 BC) and continuing up to the current emperor, Akihito; see its family tree. Historical evidence for the first 29 emperors is marginal by modern standards, but there is firm evidence for the hereditary line since Emperor Kinmei ascended the throne 1500 years ago. Article 5 of the Imperial Household Act (皇室典範, Kōshitsu Tenpan) defines the imperial family (皇族) as the Empress (皇后, kōgō); the Empress dowager (皇太后, kōtaigō); the Grand empress dowager (太皇太后, tai-kōtaigō); the Emperor's legitimate sons and legitimate grandsons in the legitimate male-line (親王, shinnō), and their consorts (親王妃, shinnōhi); the Emperor's unmarried legitimate daughters and unmarried legitimate granddaughters in the legitimate male-line (内親王, naishinnō); the Emperor's other male descendants in the legitimate male-line (王, ō) and their consorts (王妃, ōhi); and the Emperor's other unmarried female descendants in the legitimate male-line (女王, joō). In English, shinnō and ō are both translated as "prince" as well as shinnōhi, naishinnō, ōhi and joō as "princess". The Prince Akishino, the Emperor's second son, and second on the succession line, was born on 30 November 1965. His childhood title was Prince Aya. He received the title Prince Akishino and permission to start a new branch of the imperial family upon his marriage to Kiko Kawashima on 29 June 1990. The Prince Hitachi was born on 28 November 1935, the second son and seventh child of the Emperor Shōwa and Empress Kojun. His childhood title was Prince Yoshi. He received the title Prince Hitachi and permission to set up a new branch of the imperial family on 1 October 1964, the day after his wedding. The Princess Mikasa is the widow of The Prince Mikasa ( 2 December 1915 – 27 October 2016), the fourth son of Emperor Taishō and Empress Teimei and an uncle of Emperor Akihito. The princess was born on 4 June 1923, the second daughter of Viscount Masanori Takagi. Princess Mikasa has two daughters and three sons with the late Prince Mikasa. Atsuko Ikeda, born 7 March 1931, fourth daughter of Emperor Shōwa and surviving elder sister of Emperor Akihito. Takako Shimazu, born 2 March 1939, fifth daughter and youngest child of Emperor Shōwa and younger sister of Emperor Akihito. Yasuko Konoe, born 26 April 1944, eldest daughter and eldest child of Prince and Princess Mikasa. Masako Sen, born 23 October 1951, second daughter and fourth child of Prince and Princess Mikasa. Sayako Kuroda, born 18 April 1969, third child and only daughter of Emperor Akihito and Empress Michiko. Noriko Senge, born 22 July 1988, second daughter of Prince and Princess Takamado. In addition to these former princesses, there are also several people of Imperial descent in the eleven cadet branches of the dynasty (Asaka, Fushimi, Higashifushimi, Higashikuni, Kan'in, Kaya, Kitashirakawa, Kuni, Nashimoto, Takeda, and Yamashina) that left the imperial family in October 1947. The Emperor Shōwa's eldest daughter, Shigeko Higashikuni, and his third daughter, Kazuko Takatsukasa, died in 1961 and 1989, respectively. Historically, the succession to the Chrysanthemum Throne has generally passed in male line of the imperial lineage. The imperial clan previously included specially designated collateral lines or shinnōke (princely houses), too. The surviving shinnōke and several other branches of the extended imperial clan (the ōke) were reduced to commoner status in 1947. Before the Meiji Restoration, Japan had eight female tennō or reigning empresses, all of them daughters of male line of the imperial clan. None ascended purely as a wife or as a widow of an emperor. None of these empresses married or gave birth after ascending the throne. Article 2 of the Constitution of Japan provides that "the Imperial Throne shall be dynastic and succeeded to in accordance with the Imperial Household Law passed by the Diet." The Imperial Household Law of 1947 enacted by the 92nd and last session of the Imperial Diet, retained the exclusion on female dynasts found in the 1889 law. The government of Prime Minister Shigeru Yoshida hastily cobbled together the legislation to bring the Imperial House in compliance with the American-written Constitution of Japan that went into effect in May 1947. 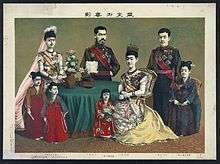 In an effort to control the size of the imperial family, the law stipulates that only legitimate male descendants in the male line can be dynasts; that naishinnō (imperial princesses) and joō (princesses) lose their status as imperial family-members if they marry outside the imperial family; that shinnō (imperial princes), other than the crown prince, ō (princes), unmarried imperial princes and princesses, and the widows of imperial princes and princesses may, upon their own request or in the event of special circumstances, renounce their membership in the imperial family with approval of the Imperial House Council; and that the Emperor and other members of the imperial family may not adopt children. Before September 2006, there was a potential succession crisis since no male child had been born into the imperial family since Prince Akishino in 1965. Following the birth of Princess Toshi, there was some public debate about amending the Imperial House Law to allow female descendants of an emperor and their descendants to succeed to the throne. In January 2005, Prime Minister Koizumi Junichiro appointed a special panel of judges, university professors, and civil servants to study changes to the Imperial House Law and to make recommendations to the government. On October 25, 2005, the commission recommended amending the law to allow females in the male line of imperial descent to succeed to the throne. Since the birth of a male son to another of Akihito's children the issue has been left in abeyance by both the public and successive governments. Ō (王) is a title (literally "king", commonly translated "prince") given to male members of the Japanese Imperial Family who do not have the higher title of shinnō (親王; literally "close-relative king", commonly translated "prince" or "imperial prince"). The female equivalent is joō/nyoō (女王; literally "female king" or "queen", commonly translated "princess") who do not have the higher title of naishinnō (内親王; literally "inner close-relative king", commonly translated "princess" or "imperial princess"). Ō can also be translated as "king" when it refers to a monarch of a kingdom. The origin of this double meaning is a copying of the Chinese pattern where a "king" is a title for noble persons under the emperor: imperial family members, high-ranking feudal lords, and foreign monarchs (excluding some strong monarchs equivalent to Chinese emperor). Unlike in China, however, ō was only used for imperial family members and foreign monarchs (except the former Korean emperor and his successors). Historically, any male member of the Imperial Family was titled ō or by default, with shinnō being special titles granted by the Emperor. After the Meiji Restoration, the difference between ō and shinnō was altered. Under the new rule, a shinnō or naishinnō was a legitimate male-line Imperial Family member descended from an Emperor down to the great grandchild. The term "legitimate Imperial Family" excludes the descendants of anyone who renounced their membership in the Imperial Family, or were expelled from the Imperial Family. Shinnō also included the heads of any of the shinnō-ke (親王家: shinnō family). 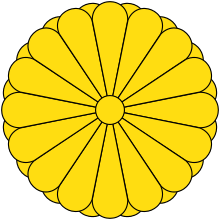 A provision of law which never had an opportunity to be applied also stipulated that if the head of a shinnōke succeeded to the Chrysanthemum Throne, then his brothers would acquire the title of shinnō, as well as their descendants (down to the grandchildren). The Emperor could also specially grant the title of shinnō to any ō. 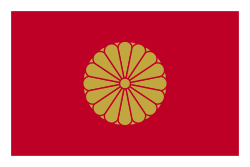 In 1947, the law was changed so that shinnō and naishinnō only extended to the legitimate male-line grandchildren of an Emperor. The Imperial Family was also drastically pruned, disestablishing the ō-ke and the shinnō-ke. The consort of an ō or shinnō has the suffix -hi (妃; female consort) to ō or shinnō, that is, ōhi (王妃) or shinnōhi (親王妃). 1 2 According to legend, Jimmu founded Japan in 660 BC, becoming Japan's first emperor and member of the Imperial House. ↑ "The Imperial House Law". kunaicho.go.jp. Retrieved 16 October 2012. 1 2 "Genealogy of the Imperial Family". kunaicho.go.jp. Retrieved 16 October 2012. 1 2 "Their Majesties the Emperor and Empress". kunaicho.go.jp. Retrieved 16 October 2012. 1 2 "Their Imperial Highnesses Crown Prince Naruhito and Crown Princess Masako". kunaicho.go.jp. Retrieved 16 October 2012. 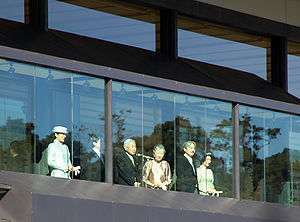 1 2 "Their Imperial Highnesses Prince and Princess Akishino". kunaicho.go.jp. Retrieved 16 October 2012. 1 2 "Their Imperial Highnesses Prince and Princess Hitachi". kunaicho.go.jp. Retrieved 16 October 2012. ↑ "Their Imperial Highnesses Prince and Princess Mikasa". kunaicho.go.jp. Retrieved 16 October 2012. ↑ "Her Imperial Highness Princess Tomohito of Mikasa". kunaicho.go.jp. Retrieved 16 October 2012. ↑ "Her Imperial Highness Princess Takamado". kunaicho.go.jp. Retrieved 16 October 2012. 1 2 "Personal Histories of Their Imperial Highnesses Prince and Princess Mikasa". kunaicho.go.jp. Retrieved 16 October 2012. ↑ "Personal Histories of Their Majesties the Emperor and Empress". kunaicho.go.jp. Retrieved 16 October 2012. 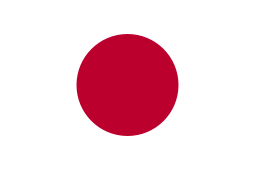 Wikimedia Commons has media related to Imperial House of Japan. Generations indicate descent from Emperor Meiji, in whose time the Empire of Japan was formed. * Reduced to commoner status with the abolition of titles of nobility by the American occupation authorities. † Lost the title upon her marriage. The Japanese princesses by marriage since Emperor Meiji's reign, who in his time the Empire of Japan was formed.